Freelance portrait photographer based in Chicago. Inspired by the world and the people in it. Cynthia uses the camera as a medium for capturing the true essence of individuals and the world from her perspective. Chicago based artist focusing mainly on eccentric portraits and pastel color schemes. Watercolor and mixed media artist who’s main subject matters are plants, animals, and crystals. Milwaukee based artist and designer pursuing a BFA in Fine Art and currently studying at Milwaukee Institute of Art & Design. Valenzuela’s work creates a relationship of line and object through sculpture creating tension and balance. The understated aesthetic of her works lure the viewer into experience the poetry of such relationships. 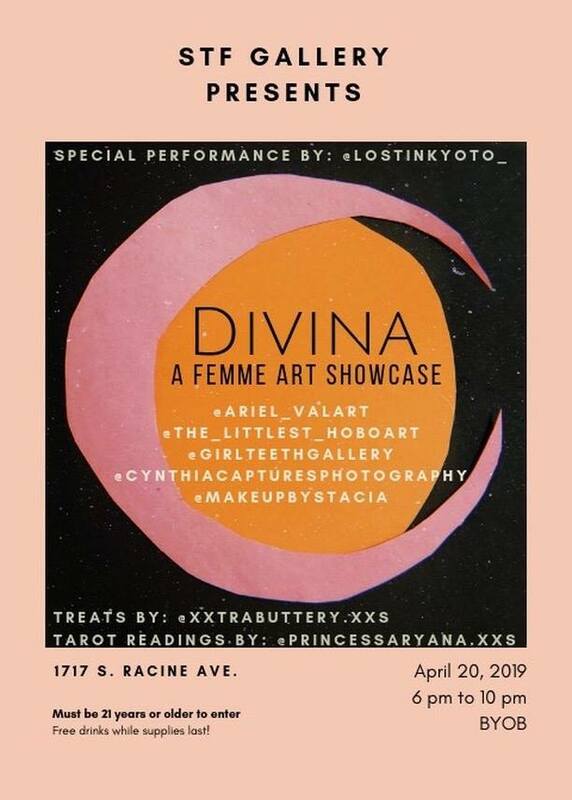 Chicago tarot reader, intuitive Pisces & personal cheerleader ☾✵☽ Aryana will be providing divination readings using tarot & oracle decks during the event. Feel good treats brought to you by women chefs. Lost in Kyoto is a music collective of DJ’s and musicians within the realms of Hip Hop, Trap, Future Funk, and House. They bring a twist of Japanese visual aesthetics and mixing.